After nearly a decade, Consolidated Industrial Gases, Inc. (CIGI) continues to rely on APC’s InfraStruXure® solution and core products to ensure continuous power of the manufacturing operations in various locations throughout the Philippines. CIGI is the leading manufacturer of industrial and medical gases for the local industries such as manufacturing, fabrication, construction, steel, automotive, shipbuilding, mining, healthcare, and food and beverage. CIGI operates 2 major production sites as well as a nationwide network of 35 Gas and Gear Centers. ASIANTECH COMPUTER CORP., one of the top computer distributor in the country today announced the RED FOX TA760G M2+ / A760G M2+, powered by ATI’s latest IGP-based chipset, the AM2-compatible 760G. A value-conscious alternative to the impressive 780G, is paired with AMD’s SB710 south bridge and offers integrated Radeon 3000-series graphics. AMD 760G+SB710 – Powered by ATI Radeon™ Graphics, DirectX® 10 introduces detail-rich images and dynamic interactivity for playing the latest DirectX® 10 games. AMD® 760G Chipset is designed up to 5200MT/s Hyper Transport™ 3.0 (HT3.0) interface and PCI Express? 2.0 x 16 graphics. With innovative products that span multiple target market, ASIAN TECHNOLOGIES COMPUTER CORPORATION (ATCC) one of the leading PC System and Notebook Manufacturer, releases the RED FOX DAVION PC System disclosing the extraordinary gaming performance of AMD’s latest Dragon Platform. Supporting the latest AMD Phenom II X4 940 processor, ATI 4870 iCQGDDR5 1GB 256-Bit PCIe2 Video Card and 4GB DDRII Memory, Red Fox Davion unleashes the full potential of capability that brings spectacular gaming platform delivering the irrefutable performance to satisfy the gaming desire of extreme gamers. 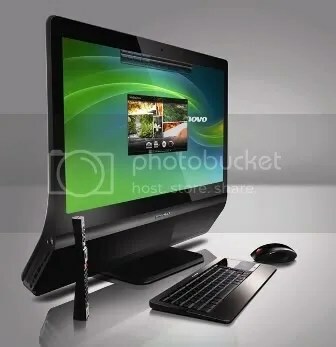 Lenovo announced the latest addition to its Idea brand of personal computers for consumers — the IdeaCentre A600 All-in-One Desktop. Lenovo brings consumers the next generation of desktop computing with the IdeaCentre A600 – Lenovo’s first all-in-one desktop. The new, sleek IdeaCentre A600 all-in-one features a 21.5-inch frameless screen, and provides discerning space-conscious and style-conscious users a modern design that measures only one inch at its slimmest point, making it the slimmest all-in-one in the industry. According to the analyst firm, vendors are assessed on weighted criteria, including products or services, sales execution and pricing, market responsiveness and track record, marketing execution, customer experience, offering strategy, business model, and geographic strategy. HP’s complete portfolio of hardware, supplies, software and services offers both small-to-medium and enterprise customers a cost-effective, productivity-enhancing imaging and printing environment. Whether the digging happens on city or provincial roads, any roadwork is an inconvenience for motorists, causing traffic to slow. Dug-out trenches also pose a serious danger especially at night, which have often been the cause of road accidents. Not mention, making the work slow and costly. This was the challenge Easter Communications faced when it embarked on a massive 240 kilometer long backhaul expansion program that would effectively link Laguna, Tagaytay, and Cavite with Makati. The ambitious project would ordinarily have meant extensive diggings that would exacerbate traffic conditions in and around the area. Given that the roads leading outside the metropolis are not as wide as Metro Manila roads, there was urgent need to employ methods and technologies that would allow for the least “inconvenience” and expedite the project without compromising the quality of the output. The first and most tedious aspect of the project is the laying of the cable, which needs to run across an extensive 240km length. The process takes a long time and enormous manpower and, if not done properly and can cause great inconvenience to motorists, pedestrians, residences, and establishments along the route. To avoid that, Eastern employed the Horizontal Directional Drilling (HDD) technology, which avoids breaking the road to dig deep trenches. Instead, HDD machines drill through a small hole underground with a detection device that guides the drill to a pre-set exit point. Hence, instead of digging a 350-meter trench that normally takes weeks, now takes only two holes – entrance and exit – and in just six hours. Laying the cables is also critical to the operation and care is taken to ensure that the fiber integrity is preserved. Cable laying is done systematically and fast, whether pulled from underground when HDDs are used or laid above ground into open trenches. Those using HDDs pull these cables from underground after detecting it through the exit hole. For open trenches, the spool of protective cable microduct is hitched to a trailer and pulled from a truck. One spool is 2 km long so it installed once a long stretch has been dug. As it is being laid, ground crew at the back covers it. Precaution is taken to ensure that no sharp objects like rocks and metals touch the sheath. Safety standards are observed every step of the way. At the end of each cable lay, a concrete housing is constructed from where the fiber optic cable is inserted via fiber-blowing machine. This machine ensures that the fiber optics is inserted safely and quickly. This machine does three things: first, it pumps water to clean out any obstruction in the sheath; second, the water is pressurized so that it creates a medium that helps lubricate and facilitate insertion of the fiber cable; and third, it mechanically and systematically inserts the cable into the sheath. What would have taken three weeks to complete now takes only three to four hours at the most.